While night guards do not protect the galaxy, they are protecting your teeth while you sleep. If you have ever grinded or clenched your teeth at night and woke up with a sore jaw, night guards can save you from much unnecessary pain and discomfort. A night guard places a protective layer of plastic in between your teeth, thus preventing the tooth enamel from grating against the enamel of another tooth. What causes grinding and clenching? Plenty of things, unfortunately. Stress, anxiety, sleep disorders, dreaming, TMJ disorder, etc. A typical sign of grinding and clenching is having flat teeth. Remember as a kid how you’d scrape a piece of chalk back and forth on the sidewalk? What happened to that piece of chalk? It eventually wore itself down to a stub. Same concept applies to your teeth. Clenching your teeth and jaw puts stress on muscles in your head and neck. Shoulder and neck pain? Headaches from pain at the lower base of your skull? No thank you. Why not invest in a handy device that will protect your chompers and circumvent unwanted physical pain? There are three types of night guards that Dr. Jessica T. Emery of Chicago’s Sugar Fix Dental Loft can prescribe you to put an end to teeth grinding and clenching: hard, medium and soft. 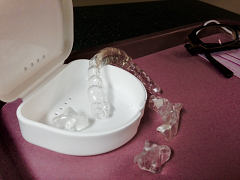 The hard night guards lock your upper and lower teeth into place, making it impossible to move your teeth back and forth while sleeping. No grinding! After placing the hard night guard into your mouth, simply bite down with the back of your teeth so that the upper and lower teeth lock into place within the night guard. Have you ever slept in the same bed or room as someone who snores? Did you get a solid night’s sleep? Uh huh. Thought so. Neither did I. Or worse – have you ever been accused of snoring when you wake up and have no recollection of doing such a thing? The shame! Deny, deny, deny. (That’s what I did.) Here’s a suggestion for you. The next time you snore (your secret’s safe with us), perhaps try sleeping with a night guard. Same goes for someone interrupting your beauty sleep. Have them try wearing a night guard. It could change your life. Snoring occurs when the soft tissue at the back of your throat relaxes, partially blocking your airway. The dreaded sound of snoring is produced by vibrations from passing air. When standing upright, your lower jaw is slightly more forward than your upper jaw. However, when you sleep in a prone position, it’s common that your lower jaw is set farther back, thus constricting the airway at the back of your throat. One of the best night guards out there to help resolve any snoring issues is PureSleep, which positions your lower jaw forward, thus opening your airway enough so that there is no obstruction. When nothing is obstructing your airway passage, there are no vibrations. No snoring! Call Dr. Emery and her team at Sugar Fix Dental Loft today and put an end to symptoms such as severe migraines, sinus type headaches, teeth clenching, teeth grinding, tooth pain, pain in joints/teeth, buzzing or ringing in ears, ear pain, neck/back pain and jaw popping. All of these sleep disrupting ailments can potentially be gotten rid of by using a night guard while you sleep. Why not try it and see how much better your quality of sleep (and life) can get? You have nothing to lose.